Saturn transit from Scorpio to Sagittarius on 26th January 2017. Saturn leaves your 9th house and will be in the 10th house till next transit (till 24th January 2020). From the 10th house, Saturn aspects your 12th, 4th, and 7th house. Planet Saturn, currently in your 9th House will be transiting to your 10th House which deals with the career. Lord Saturn is the Ruler of your 11th and 12th House. Generally, it is said that the presence of Saturn in your 10th House will not be beneficial to you. But leaving aside such general comments, let us view the effects of this transition for your Birth Sign. Your name and fame in the society will swell and the prevailing bad notions about you will be wiped away. The government-related news will be favorable and any obstacles related to the government will also vanish. Instead of indulging half-heartedly into any new venture, take quick-witted, clear but calm decisions and you will succeed. Don’t be too tight-fisted with your money and spend wisely on needed repairs and activities. This will help you to avoid unnecessarily large expenditure in the end. You will be traveling frequently, and it would cause a few troubles for you. Be careful with your words and do not indulge in gossip. Cash flow will be quite good. Be careful while driving. 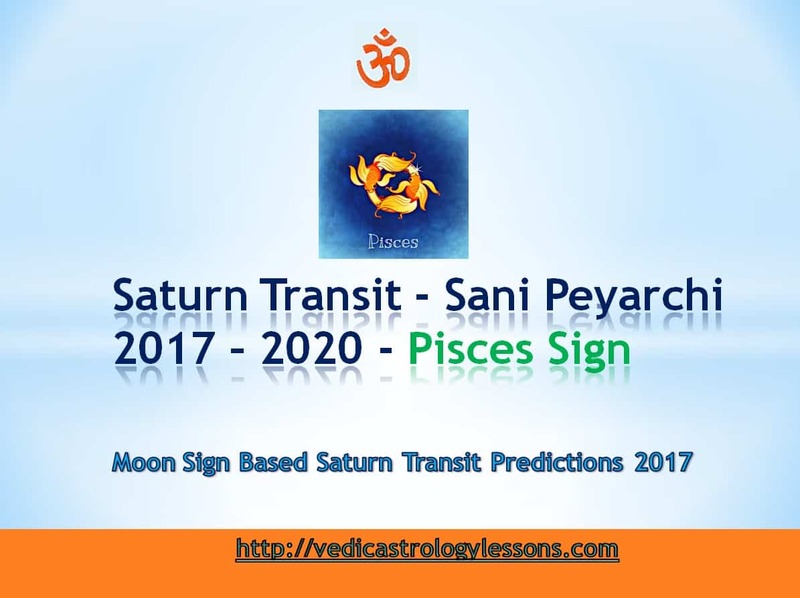 You can also Saturn Transit 2017 from VedicAstroZone. You will have to change your location frequently. You should be careful when undertaking new ventures. Any expected news would not be favorable. You will have trouble learning new things. Troubles due to your siblings will arise and solve themselves. Your relatives might cause some misunderstanding, resulting in some sadness for you. You might have to be estranged from your close ones. You may buy new properties by divesting your old properties. Unexpected expenditure due to house repairs can be seen. Obstacles may arise when you try to rent or lease your house, but they will disappear soon. Some might get a satisfactory house to live in. After the Saturn Transit, Long standing hindrances in acquiring new properties will go away and the time is ripe for your investment. Difficulty in trying for higher studies will lighten up and you will get the chance to pursue good degrees. Your job will be fraught with hardships that can be overcome with hard work. Your current situation will be unsatisfactory. You might have to get new loans to pay off your old debts. You will fare well in competitive examinations and start on good careers. You will get new loans easily. Court cases will work out in your favor slightly. Those who wish to divorce will get their request granted. Your uncles from your mother’s side will be helpful. Your pets will bring you happiness. Delays in your marriage will get resolved and will take place shortly. You will participate in many parties and celebrations. The relationship between husband and wife will be good. Your romantic life will be agreeable. Your friends might cause some hurt. Take good care of your mother’s health. New friends will ring in good benefits to you. Based on your current Dasa and Bhukti(Subperiod) the effect of this Saturn transit for Pisces sign will change.